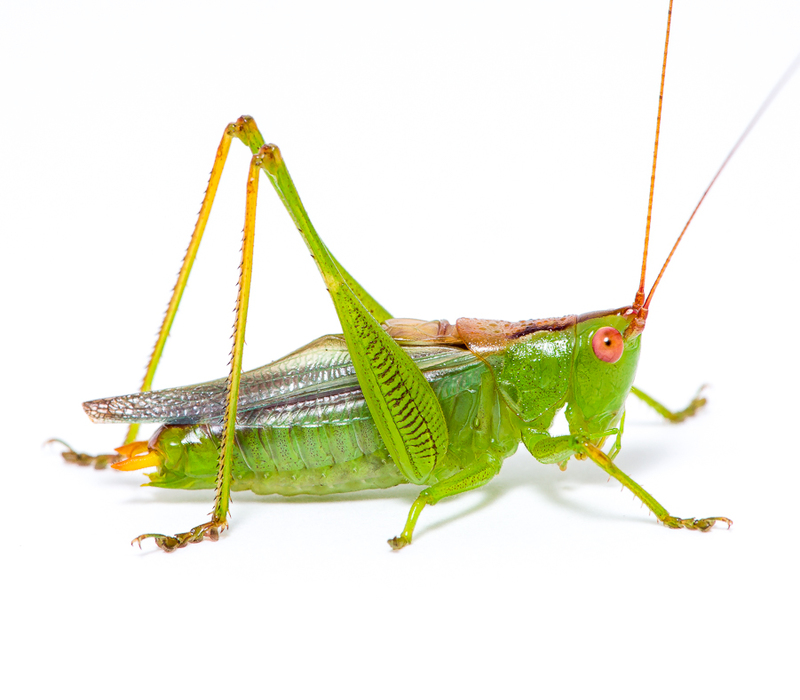 Song of a Long-spurred Meadow Katydid (scroll down for explanation and additional recordings!). 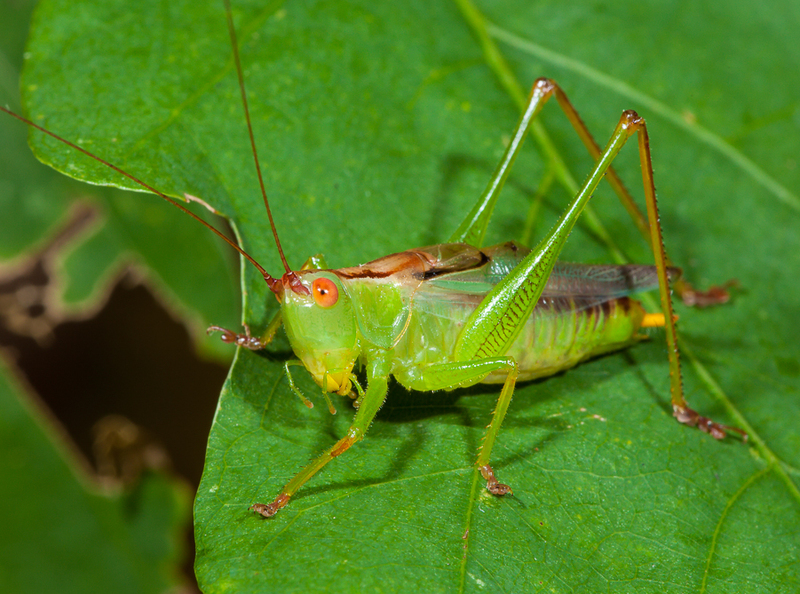 Bright orange eyes, a deep green body, reddish brown along the top of the abdomen, and yellow cerci combine to make the Long-spurred Katydid an elegant-looking member of its genus. This midwestern species is arboreal in habits and is fond of junipers and cedars. 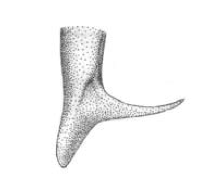 Named for the long spurs on its cerci. It is similar in appearance to its close relative, the Lesser Pine Katydid. 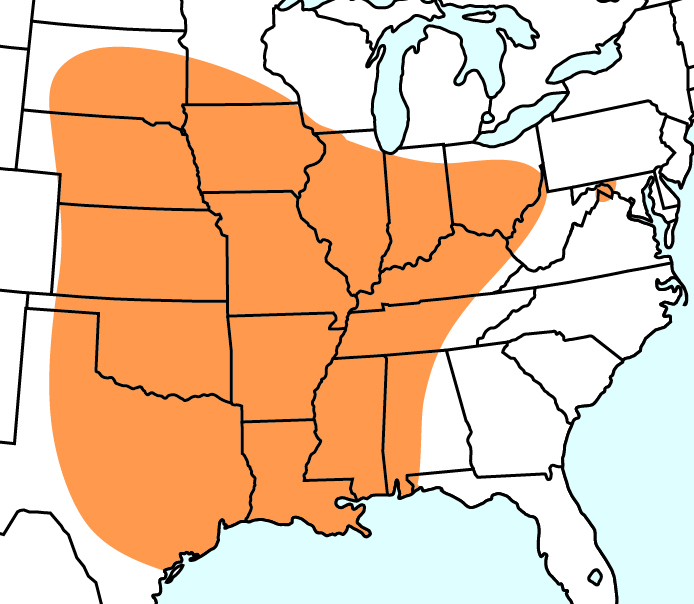 Range Map for Long-spurred Meadow Katydid. Long-spurred Meadow Katydids range within the central US from the Gulf coast north to southern Minnesota. From the southeastern portion of South Dakota, most of Nebraska, Kansas, Oklahoma, and all but the western portion of Texas. 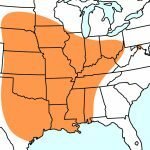 Then east to the western half of Alabama, Tennessee, and most of Kentucky and the all but the northernmost areas of Ohio, Illinois, and Indiana. This species appears to be in the process of expanding its range into the eastern panhandle of West Virginia, as well as Washington and Frederick Counties of Maryland. Starting in 2017, scattered individuals were seen and heard in Berkeley County, WV and a large colony covering several acres of woodlands and edges was found in southern Jefferson County, WV. Large numbers were observed in eastern Frederick County, MD in the summer of 2018. Several singing males have also been observed in Washington County, MD in 2017 and 2018. Orthopterists should be on the lookout for this species and report observations outside of those areas indicated on the range map. Information is needed for the occurrence, or lack thereof, of this species in the central portions of West Virginia (i.e., along Routes 68, 79, and 50) to determine if there is a connection to the main population in the mid-west. Song: Several seconds of loud stuttering ticks that blend into a long shuffling trill, with a frequency of 8–20 kHz. Listening to a colony softly their songs on a warm summer afternoon is a pleasing and relaxing experience. The songs are soft, almost purring and therefore not easily heard from a distance. As you approache a group of singing males, you become aware of a new sound in the background that requires some attention and focus to discern. Sonogram of a Long-spurred Meadow Katydid. © Wil Hershberger. It may also be doxycycline to buy in uk used to treat other conditions as..